Subjecting prayer to scientific scrutiny has long been controversial, but both religious groups and researchers are increasingly friendly to the idea. 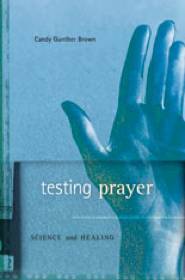 In her new book, Testing Prayer: Science and Healing (Harvard University Press), Candy Gunther Brown looks at the controversy of scientists studying prayer and alleged healings, taking into account those who question the whole enterprise of scientifically investigating prayer (both scientists who scoff at religious practices and believers who oppose any empirical testing of faith) and the growing segment of scientists and believers who seek to subject prayer to scientific and medical scrutiny for their own reasons. The subject of testing prayer through scientific methods has become more contested in recent years because of the sharp variation in results of such experiments. Even scientists supporting prayer research are at odds about results over intercessory prayer. While past studies showed a positive outcome for those receiving “remote prayer” -using designated “pray-ers” who intercede at a distance for patients they don’t know- a major recent study has shown negative results, though it is highly contested on methodological grounds (mainly in terms of the problems of having control groups). The study examined 1,800 coronary patients at six U.S. hospitals, with one group receiving intercessory prayer after being told they might or might not receive such prayer, and the other group not receiving prayer after being told they may or may not receive it. A third group was prayed for and was told that they were receiving prayers. The study found that intercessory prayer had no effect on complication-free recovery from heart surgery. Throughout much of the book, Brown focuses on Pentecostal and charismatic groups and their healing ministries and finds that they are also divided about subjecting their practices to scientific scrutiny. After decades of many Pentecostal churches accumulating medical records to demonstrate proof of healings, many have taken a “postmodern” approach that spurns the need to prove anything scientifically, although they have engaged in videographic documentation; films popular in some Pentecostal circles, such as Finger of God (2007), seek to document healings and even cases of the dead being raised. Yet the newer movements such as the Vineyard, which are often called “postmodern,” are ironically more likely to support the measurement of spiritual effects. Brown conducts her own study on the effects of prayer on healing, though she focuses on “proximal prayer”-where healing prayer is conducted through personal contact. With her research team, she studied the charismatic ministry Global Awakening in Mozambique, Brazil and North America. Looking at the effects of prayer on blindness and deafness, Brown and her team gave diagnostic hearing and vision tests immediately before and after the healing sessions. Through observation, interviews and follow-up investigations, Brown found that the “magnitude of measured effects,” especially in Brazil and Mozambique, exceeds that reported in previous studies on the power of suggestion and hypnosis. Testing for these effects in the U.S. yielded unclear results because of technical issues, she adds. United States: the beginnings of a neo-traditionalist revival in American Catholic church architecture?